AutoWash is a great time saving feature of the intelligent Commander. Time is money and if you would like to save some of it you might consider the new HARDI Australia Intelligent Commander which was released in MAY. Imagine activating an AutoWash program from the cab of your tractor before you leave the paddock and the sprayer is decontaminated. 'This is a reality and its available now on the new Commander i with HC6500 processor', and according to Graeme Johnson Managing Director of HARDI, 'it is about to clean up the market'. 'The new HC6500 is the intelligence behind the Commander function management systems and rate control, which guarantees the highest level of performance', said Graeme. 'This includes three AutoWash programs. If you are planning to change chemicals or crop in the next tank load you can simply select the AutoWash program hot key called MultiRinse while still in the paddock. The rest is automatic', he explained. The MultiRinse program performs 7 rinse actions automatically to reduce the residual concentration in the new Commander to as low as 0.05% with only 400 litres of water. This requires 39 automated sequences to be managed by the HC6500. The operator doesn't have to calculate the volume nor the duration required to do a suitable rinse cycle or worry about which valve function to select. The AutoWash programs are easy to use and saves valuable spraying time. The SmartValves are positioned electrically and the process is carried out in the field without the need to get out of the tractor. There are 3 rinse programs that suit situations faced by farmers every day during the spraying season. BoomFlush, FastFlush and MultiRinse. BoomFlush takes less than one minute and is designed to flush the spray lines when there is an interruption in the spray task like rain. FastFlush takes less than two minutes and is used where the same chemical is applied the next day on the same crop. 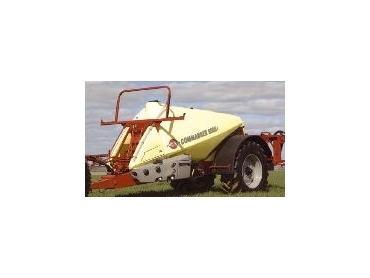 MultiRinse takes about eight minutes and is used when there is a change in chemical or crops sprayed. These flush and rinse cleaning processes carried out in the field minimise residues ending up at the filling point. The operator remains in the cab and avoids potential contamination from equipment and treated crop. AutoWash is managed by the HC6500 in a similar manner to the cycles on a washing machine. When used in conjunction with PrimeFlow a pressure base circulation system the boom lines can be flushed without spraying onto the ground. PrimeFlow circulates and primes the boom before spraying. ON/OFF electric stepper motors replace the spring-loaded non-drip valves at each nozzle. Individual nozzle control provides for the most effective use of rinse tank water when cleaning the sprayer in the field. Opening and closing of the nozzles is fast, positive and less vulnerable than vacuum based systems. The HC6500 is a modern state of the art sprayer control system designed to take care of function management and rate control to provide the highest level of application precision. The operating status and vital information can be assessed and implemented via finger-tip controls. The onboard Jobcom contains the printed circuit boards and is the service point for all of the electronics used in AutoWash and PrimeFlow. AutoAgitation comes standard with AutoWash and works in conjunction with TankGauge. The TankGauge monitors the fluid level and the agitation is adjusted to suit the volume. 'These new Commander innovations combine capacity, functionally and user-friendliness to make spraying and decontamination a safer and hasslefree task' concluded Graeme.